Charlene Baldwin, the mother of Sgt. 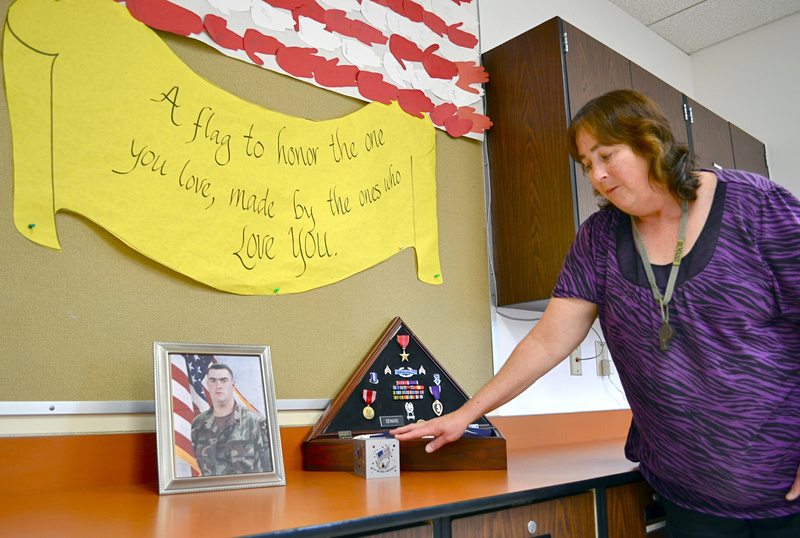 Jacob H. Demand, said the small town of Palouse, Wash., continues to remember her son, who was killed in Mosul, Iraq, two weeks before his tour was to end in September 2004. PALOUSE, Wash. – Sgt. Jacob H. Demand died a world away from his small hometown in Eastern Washington, gunned down in Mosul, Iraq, two weeks before his tour of duty was to end in September 2004. But here in Palouse, population 998, the memory of Demand lives on. “You know how usually someone only has one best friend? There are at least 15 people from Palouse that still call Jake their best friend,” said his mother, Charlene Baldwin. About half of all enlisted recruits come from smaller towns, according to data from the U.S. Department of Defense. Recruitment rates in non-metropolitan counties are 20 percent higher than in metropolitan counties, according to the National Priorities Project, a left-leaning think tank that analyzes federal data. A weak economy in rural areas of the country has led more young men and women to enlist, according to the authors of a national study by the Carsey Institute at the University of New Hampshire. “Unemployment is, by far, the most dominant economic consideration linked to the propensity to enlist in the military,” said Bill Bishop, co-author of the study. Those higher rates of recruitment have led to a disproportionate loss of life in rural communities, the Carsey study found. The 2006 study found a death rate of 24 per million among rural men and women, compared with a death rate of 15 per million in urban areas. In Washington and Idaho, those deaths have echoed in small towns like Wilbur, Craigmont, Granger, White Swan, and Colville. In St. Anthony, a town of 3,542 in eastern Idaho, residents lined the sidewalks and waved white flags during the 2005 funeral procession for Lance Cpl. Dustin Vincent Birch, who died when a roadside bomb hit his vehicle in the Anbar province of Iraq. After Army Staff Sgt. Wyatt Andrew Goldsmith died in Afghanistan in July, more than 800 people attended his funeral in Colville, population 4,673. Surviving veterans often face unique challenges when they return to rural communities, experts say, such as a lack of resources to help them reintegrate. Veterans in rural areas often experience worse mental health problems and cost more to treat, studies from the American Psychiatric Association conclude. Distance is just one of the challenges. In North Idaho, veterans are funneled into VA services in Spokane. Those in Nez Perce, Lewis and Clearwater counties use the VA Medical Center in Walla Walla. Idaho’s only VA hospital is in Boise, although it has clinics in other cities. To help vets in rural areas, the Boise VA has begun using new “Telehealth” technology, said Dr. Beth Fassig, a psychologist there. “We’re helping patients get set up with the right equipment so we can have both audio and visual connection with them,” Fassig said. In Washington, 13 rural counties do not have veterans’ centers to treat post-traumatic stress disorder and related problems, according to the state’s Department of Veterans Affairs. In those areas, the VA contracts with local counselors. As in Idaho, counselors in Washington have begun to use televised links to connect veterans with medical care. Experts say isolation can make the transition home particularly difficult to veterans. Rural families of soldiers bear a burden as well, but many say that small towns are especially supportive. In Rochester, Wash., the family of Army Cpl. Christopher Nelson witnessed that support. Nelson, 22, was killed by a suicide bomber in Iraq in 2007. He was delivering candy and toys to children when he died. The 22-year-old left behind his wife, Angela, his high school sweetheart. After his death, American flags filled the town and a billboard featured Nelson. “Everyone in town knew of Chris or someone in the family. Everyone came together in support,” said Julie Marquez, Chris’ sister-in-law. In Palouse, Jacob Demand is still remembered seven years after his death. His photograph is displayed in the local school. The town has a memorial plaque dedicated in his honor. “I’ll never forget when during the Palouse Days parade, the grain truck drivers from around the area paraded through the town, each with a sign with Jake’s name on it as they passed us,” said his mother. Marine Cpl. Joseph Phillip Bier died on Dec. 7, 2005, when a roadside bomb detonated during combat operations in Ramadi, Anbar province, Iraq. The 22-year-old lived in Chehalis before he joined the Marines. At Bier’s funeral, the local church was “packed wall-to-wall,” according to his father, Wayne Bier.